Type 2 storage is ATF Approved via CFR 555.11 We offer special prices and budgetary pricing to meet your fiscal purchasing year requirements. 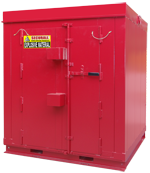 Securall Magazine storage are designed to be Weather, Fire and Theft Resistant. Additionally, Securall is the only Magazine Manufacturer currently offering an optional upgrade of 2 or 4 hour Fire-Rated Walls. Also, our proprietary wall design has been tested and rated to withstand F-5 Tornado winds and associated impacts (Texas Tech University Wind Science and Engineering Research Center). 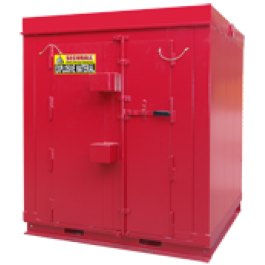 These ATF Approved and IME/DOT Approved buildings and boxes meet or exceed the following specs: 900 Series – NSWC 3046-93-1, Armories – NSWC 3046-93-2, IME/DOT Boxes – IME SLP-22 Title 27 Code of Federal Regulation, Dayboxes, Type 2 (Indoor and Outdoor), Type 4 (Indoor and Outdoor) – Section 55.11 of the Bureau of Alcohol, Tobacco and Firearm Regulation (ATF) for Explosive Storage Containers. Standard and Custom Size Explosive Magazines Storage are available in ATF Approved Type 2, Type 3 or Type 4 ratings. Approved for the storage of Type 2, Type 3 and Type 4 Magazines Storage of Ammunition and Explosives.